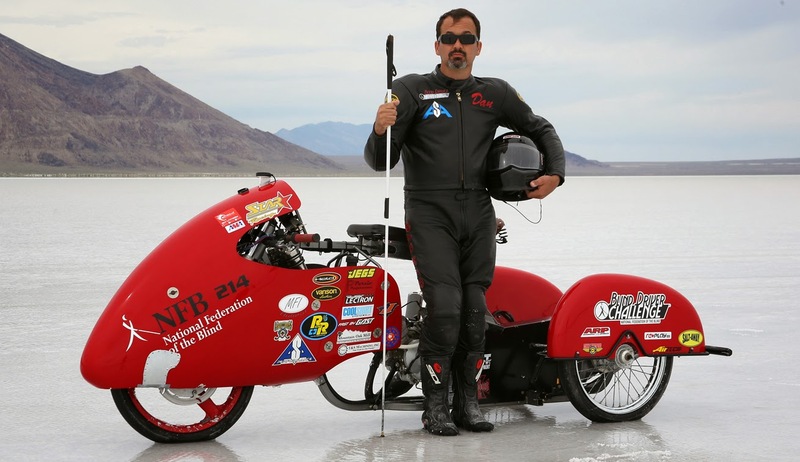 Dan Parker's blindness didn't prevent a record run at Bonneville. The Royal Enfield Continental GT set a record at the Bonneville Salt Flats in August, overcoming a hectic last-minute blitz of electronic/mechanical bugs and inclement weather. The hustle didn't stop Team Royal Enfield member Kevin Mahoney, president of Classic Motorworks, from checking out the other racers. 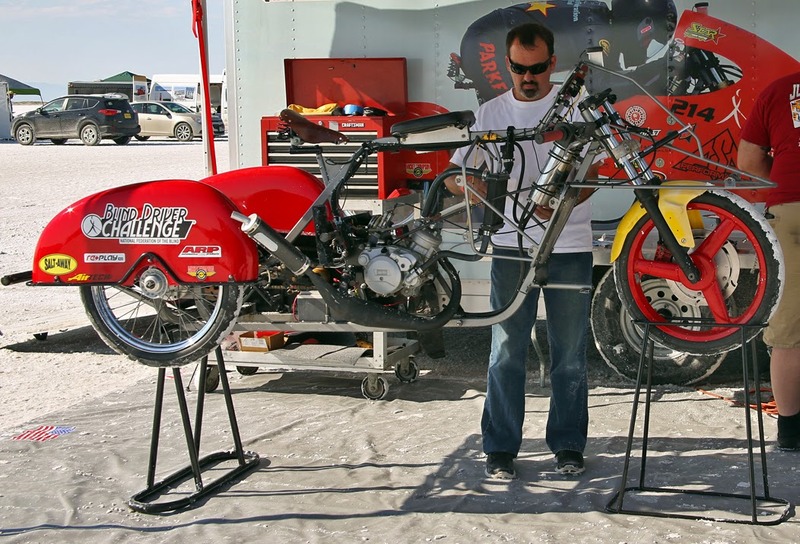 He posted a neat Facebook gallery of photos of unusual Bonneville race bikes. In one case, though, his attention was attracted by the rider, not the bike. Dan Parker, who was blinded in a drag-racing accident in 2012, rode a three-wheeled motorcycle he constructed himself, to a world record in the 51-85cc two-stroke cycle-car class. Dan Parker, with his racer, on the salt at Bonneville. Parker walks with the white cane, visible in the photos, but he rode with the aid of a GPS system that gave him audible cues in order to help him maintain a straight course. The GPS system was designed and built by engineer Patrick Johnson. "I was quite puzzled when I saw that guy in line for tech. He did pretty well all things considered. Had some (guts)," Kevin wrote. According to a press release from The National Federation of the Blind, one of his sponsors, Parker completed a two-way run, reaching an officially recorded top speed of 64.8 mph on one pass and an average top speed of 62.05 over both passes, thereby setting a class world record, pending ratification. Rick Head, of Exile Turbo Systems, was at Bonneville with Parker, and provided the photos you see here. Parker wore leathers with the logos of the National Federation of the Blind and its Blind Driver Challenge. That's a program that encourages innovative non-visual solutions that empower the blind — even to drive. “Last year I was thrilled to witness Dan Parker’s run on the Bonneville Salt Flats, the first ever by a blind person," Mark Riccobono, president of the National Federation of the Blind, said in the press release. "This year, Dan has not only proven once again that blindness is no barrier to living the life you want, but has set a world speed record in the process."